Although we have a policy of not announcing dates until we’re 100% sure, it is safe to say we are now very, very close to getting the leafcutter beta out to Kickstarter closed beta tier backers. Those of you who are on this tier, please keep an eye on your emails over the next week or so. 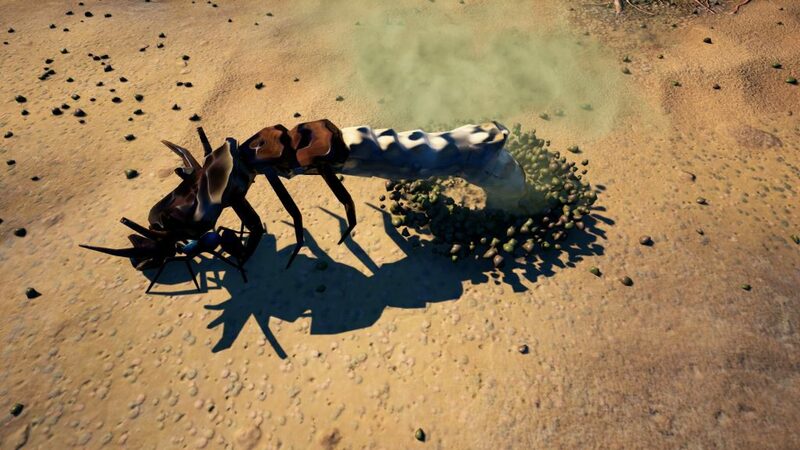 The coming build for you guys will be feature-complete from a gameplay perspective, but will be missing some things like sound effects (the new creatures currently all sound like the Devil’s Coach Horse adult). Those will be added in throughout the beta as we continue development. As a quick explanation for everyone else – the closed beta group consists of people who supported us at a certain tier during our Kickstarter campaign in 2016. The beta typically lasts a few weeks, where we take feedback on things like balance and glitches. It really helps us polish things to be great for everyone and gives a bigger sample size than just the four of us on the team, and it means when we get the update out to everyone it’ll feel really good to play right from the off. Of course, things like balance and glitch fixes don’t end when the beta does (the size of the beta group doesn’t come close to all users!) so we will still be very grateful for your feedback as things continue. A short time into the beta, we should have a fairly good idea of how long it’ll take us to deal with the resultant feedback and it’s at that point that we’ll decide on a release date. Exciting times! Since we’re so close to having things ready, there hasn’t been much in the way of “new” stuff to show over the past month (not because there’s nothing left, but we’ve reached a limit on things we want to share without spoiling the upcoming content too much). One of the more fearsome beasties you’ll encounter in your life as a leafcutter colony is the leaf mimic praying mantis. There are several sizes of mantis, but in its final instar it’s an outright terrifying opponent that even well-prepared players will find difficult. Here’s a preview of her in the Battle Arena, against a fairly typical mix of leafcutters. 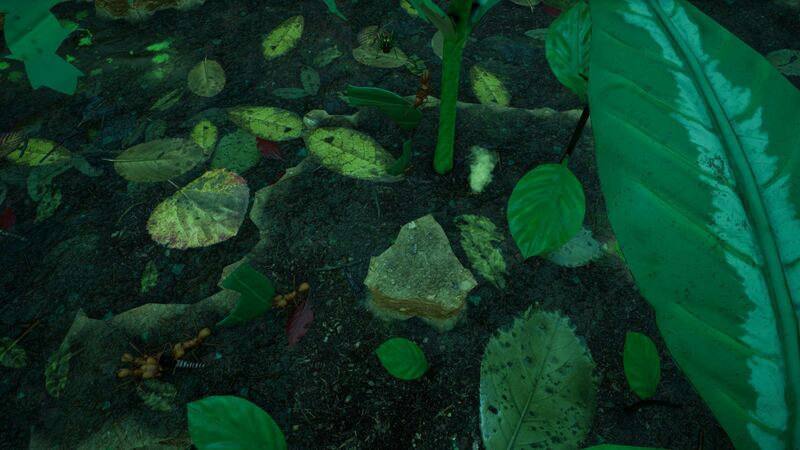 She has some unique stealth abilities due to her natural camouflage – note that she doesn’t appear on the minimap until she decides she’s going to attack, and the ants have to be very close in order to spot her. This makes more sense in the context of a rain forest floor covered with leaves. You’ll also notice that she has the ability to pick up an ant and consume it, instantly killing it and restoring health. This gives her remarkable durability, so she must be overwhelmed quickly and with large numbers. Majors are a little big for her to eat in this fashion, but minors and mediae go straight down the hatch! Here’s a sped-up look at the enemy leafcutter colony you will encounter in level 3.1, The Harvest. It’s controlled by the AI (but it has a pre-built nest layout, which makes sense for the campaign levels). Fully autonomous AI colonies will eventually feature in Freeplay. Some of the ants have a green cloud surrounding them. This is a status indicator showing the ant has recently been in a refuse chamber – which causes sickness to ants that aren’t minims. You’ll want to build your refuse chambers away from thoroughfares and brood chambers. 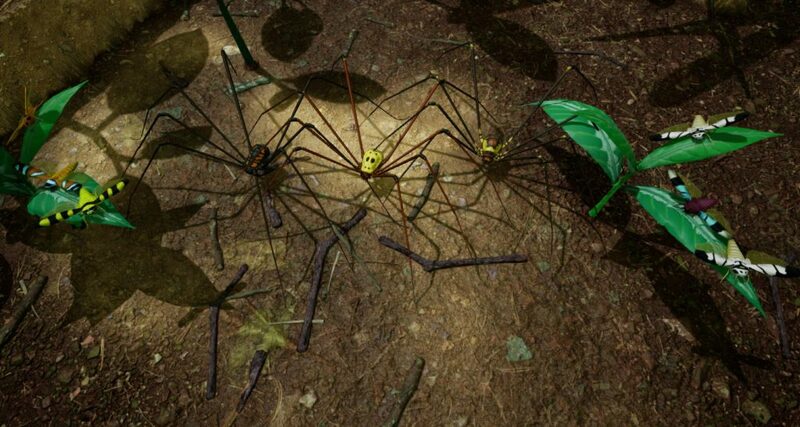 Here’s a couple of screenshots showing some of the cosmetic variations we’ve added to the appearance of some of the creatures – in this case the leafhoppers and the harvestmen. Although not strictly necessary from a gameplay perspective, we’ve taken the time to do things like this in order to try and reflect some of the huge natural diversity that exists in rain forests. Of course we can’t come close to how diverse they actually are, being the richest terrestrial environments on the planet – but we can try to replicate it in a small way. Here’s something a little different – an in-editor look at 3.1 The Harvest. 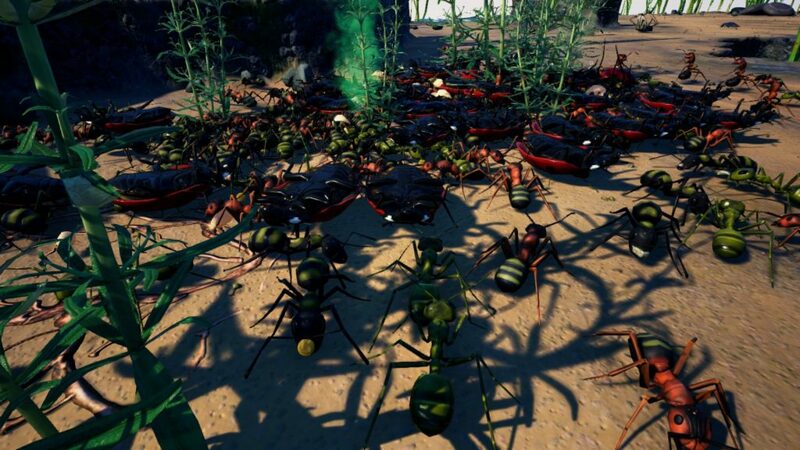 We use Unreal Engine 4 to build Empires of the Undergrowth. It’s an incredibly comprehensive and featured development environment, and this video shows a little behind-the-scenes look at the workings of a level. The white lines on the plants are mathematical objects called splines. 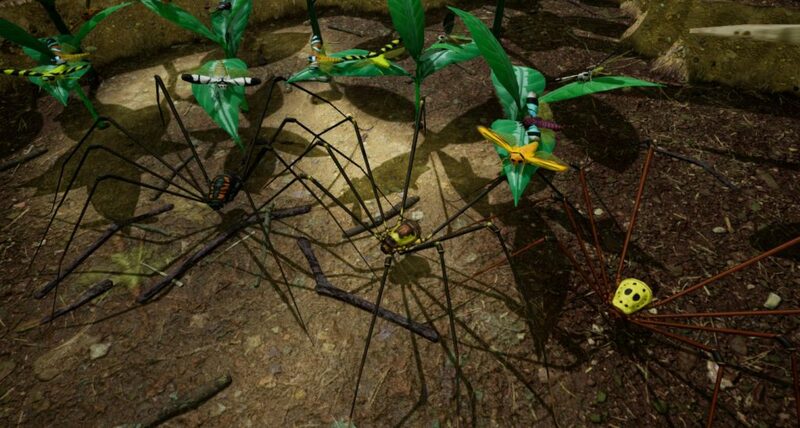 These act as a guide to the pathfinding AI and indicate that these are plants that can be climbed and harvested by leafcutters for their fungus farms. The bright green and red on the floor is called the navmesh – it indicates the areas of the map that are navigable by creatures. It’s a static object on the surface, but often has to be re-computed underground because the player changes it with their digging! The screen with the large, complex-looking flowchart is called a blueprint. These are a powerful feature of UE4 which we find particularly useful for AI behaviour. In this one, you can see that every few seconds it “thinks” – indicated by the orange line as it follows the algorithm and reaches a decision. 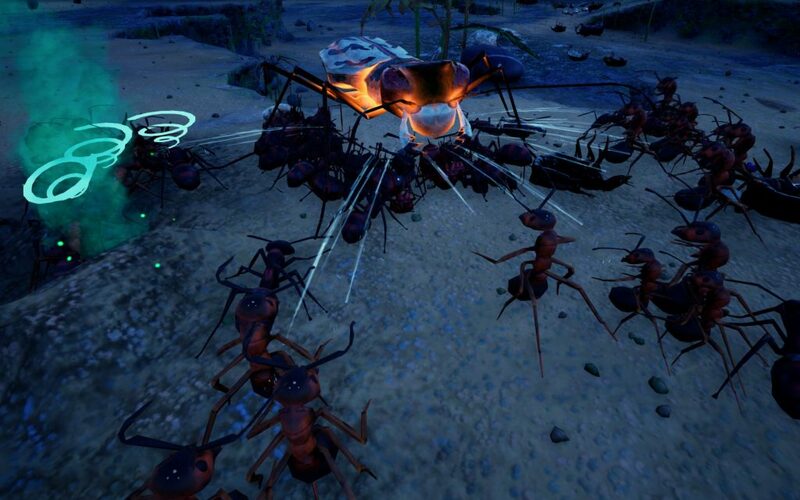 This is the AI for the enemy ant colony in level 3.1 – it reacts actively to the player, making its own decisions instead of following a timed script, like the colonies in 2.2 do. Since we’re so close to having things ready, it’s time to start thinking about trailers. We love a good trailer – they’re a great way to build up some awareness and, dare we say it, hype for a release. We have a background in short film-making, in fact it’s the shared hobby that brought all of us together many years ago! The above is a look at an in-progress shot designed by Liam. We make custom builds with trigger-able camera moves to capture our trailer footage using OBS. Ignore the sound for now – as mentioned above a lot of the new sounds aren’t in yet; that will all be sorted later! Every so often, John has been posting recent changes to the source control of the game on our official forums. These can offer a little insight into what’s currently being worked on. As before when we’ve done this segment, here’s his full post but here’s a few selected highlights with some extra commentary to give more context. 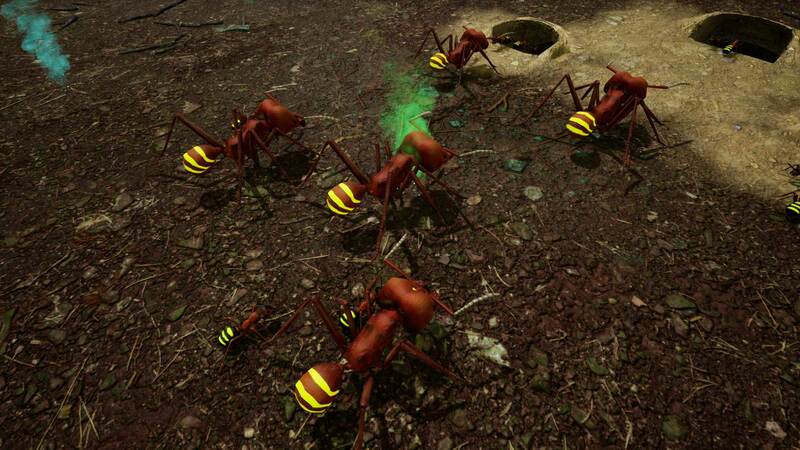 Minimap displays gather-able resources – all food items that can be gathered, whether they be leaves for the leafcutters or dead creatures for other ants, will now show up as a dot on the minimap. This should help players direct their forces to resource-rich areas with more certainty. New Freeplay setup screen added – John has expanded and re-designed the Freeplay setup screen to be a bit clearer. This is the first step in his overhaul of Freeplay which will begin in earnest once the leafcutter update is out. Prepared documents for localisation – we’ll be adding the first two translations to the game soon (German and Chinese) and there’s been a lot of prep work involved in this process. Lots of work on the trailer for leafcutters – Liam has been designing shots for the upcoming trailers, as detailed above. He’s been making custom builds of the game that showcase designed camera moves. Gather and aggression buttons updated for colour-blind – it was pointed out to us that our colour scheme for the gather / attack toggle buttons is difficult to differentiate for people with colour blindness. They now have a visible line across them when switched off. Added in chunks for every creature in the game (no longer will harvesting a fish produce a Devil’s Coach Horse leg) – up until now, harvested creature chunks all shared the same models and textures. Matt has put in some work to make sure this is no longer the case. Added canopy shadows to the new levels – as is fitting for the rain forest, the third tier levels will have a dappled lighting effect on the surface to represent bright sunlight filtering through the treetops. We’ve been spoiled for choice on the beautiful screenshots this past month – you lot have really been upping your game! It’s been difficult to choose three really good ones from many very pretty examples, but here they are. As always, take your screenshots on Steam (F12 is the default key) then upload them when you exit the game from the window that pops up. You can get some great angles by using Photo Mode (F9 by default). Alternatively, you can manually email screenshots to mike@slugdisco.com.